If you want drum tones that sound great in your recordings, then you have to spend time getting them to sound great in the real world. Recording a great sounding kick drum starts with exactly that-a great sounding drum. These days there’s a bunch of manufacturers making high quality and affordable drums, so let’s assume you have access to great sounding instruments. The next order of business is tuning the drums. Too often otherwise great sounding drums end up not sounding so great in a recording because they were not properly tuned. And don’t make the mistake of not learning how to tune drums just because you don’t play them. If your idea of a great sounding recording includes great sounding drums, then someone on the session needs to know how to tune them. Assume no one else knows how to tune drums, and just learn the skill yourself. After getting the drum properly tuned up, find the best place in the room to record it-the sweet spot where the drum sounds best. This might also require putting up some blankets or towels around the room to dampen some of the reflected sound. Finally, it’s time to mic up the drum. A a pretty common approach to recording kick drum is to use two microphones-one inside the kick, and another outside, then blend the two mics together when mixing. Be that as it may, my opinion is that less is more, so most often I simply use only one mic to record the kick. 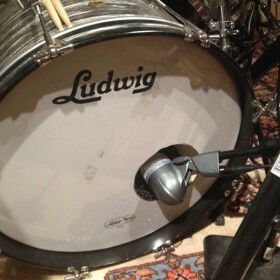 The most typical place to position a mic to capture the bass drum is partially inside the port hole of the front head. However, there are no rules, and I’ve had success placing the mic in various other places, including inside the kick and right up against the beater head, outside the front head entirely (usually when the font head is not ported), and even angled underneath the snare pointed at where the actual beater makes contact with the head. Start out with what’s typical, and if you feel like something is not working, use your instincts to try something else. Also, in regards to mic position, a little goes a long way. Moving the mic half an inch might fine tune things in exactly the right way. As is the case with pretty much everything in record making, what makes for a good sound is subjective. This is art. 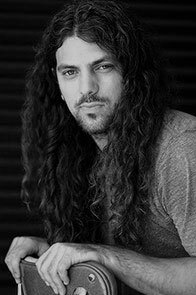 What truly qualifies as a “great sounding bass drum” depends on the context and identity you have steeped into your artistic statement. If “small and papery” is the sound you’re after, then just make sure that sound is consistent with your overall style and it will be the perfect understated punch of drumming irony. Conversely, if “thunder of the gods” is more your attitude, just make sure it supports the bigger picture from a sonic perspective, and you will be making the sky collide.